The chief cleric of the Lal Masjid (Red Mosque), Abdul Aziz, had announced a Taleban-style Islamic court would be set up to curb "vulgar" activities. The protest organisers, the Muttahida Qaumi Movement (MQM), branded the mosque "religious terrorists". 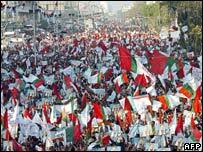 The MQM is largely supportive of the policies of President Pervez Musharraf. MQM leader Altaf Hussain told Sunday's rally by telephone from London via loudspeakers: "Islam is a religion of peace and there is no place in it for using force or terrorism. "The people of Islamabad are insecure and under threat due to the activities of these religious terrorists." Abdul Aziz is a vocal critic of the Pakistan government's support for the US-led "war on terrorism". Last week he announced a court based on Islamic Sharia law and began an anti-vice campaign. The court passed a fatwa on Tourism Minister Nilofar Bakhtiar after she was pictured hugging a man following a paragliding flight. Mr Aziz has also threatened to "take action" if the government moved against his mosque. Analysts say Gen Musharraf has been criticised for not taking a harder line but may be reluctant in an election year.